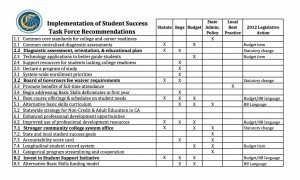 The California Community Colleges Board of Governors approved far-reaching recommendations Monday to increase graduation and transfer rates, including rationing access to classes. The vote on the Student Success Task Force proposals followed more than three hours of emotional public comments, occasionally veering into angry outbursts that prompted the Board president to warn he’d call off the remainder of the public testimony. “I was hoping for a civil discussion,” said Board president Scott Himelstein, who nonetheless said it was good for the Board members to hear the strong opinions about the recommendations. The most controversial elements in the package of 22 reforms provide carrots and sticks to encourage students to enroll full time and stay on track toward earning associate degrees, earning certificates, or transferring to four-year colleges and universities. Those students would get priority enrollment, along with first-time students who take part in college orientation, undergo college-readiness assessments, and develop education plans; and students who start taking any remedial classes they need during their first year. The recommendations also set conditions for students to receive Board of Governors fee waivers, including excluding students who have more than 110 units – nearly twice as many as needed for a degree or transfer – with no completion goal in sight. Dozens of community college students in the packed hearing room in the State Capitol argued that those restrictions would have the opposite of their intended effect and drive away the poorest students, who can take only one or two classes a semester because they have families to support and need to work. Students also questioned the Task Force’s definition of success, arguing that just being in community college is a triumph for some people. “My story is the exact opposite of the definition of success within the document you’ve been presented with,” said Joseph Fitzgerald, a 25-year-old student at City College of San Francisco. After a series of family tragedies, Fitzgerald said he had to learn to fend for himself by the time he was ten years old. When he finally enrolled at City College, he had never learned how to do homework, study, or manage his time. The Task Force was created last January through Senate Bill 1143, authored by State Senator Carol Liu (D-La Cañada Flintridge), after several reports found dismal completion rates at the state’s community colleges. Currently, only about 30 percent of students complete an associate degree or a certificate, or transfer to a four-year college or university within six years, according to Divided We Fail, a 2010 report by the Institute for Higher Education Leadership & Policy at Sacramento State University. The numbers are even lower for Latinos and African American students: 20 percent and 25 percent, respectively. Jeannette Zanipatin, legislative staff attorney with the Mexican American Legal Defense and Educational Fund (MALDEF), told Board members such low levels of student success require “transformative change” throughout the community college system, even if the resources aren’t immediately available. Monday’s action may have marked the end of the Student Success Task Force, but it signaled the beginning of a more difficult phase in the process: implementation of the recommendations. 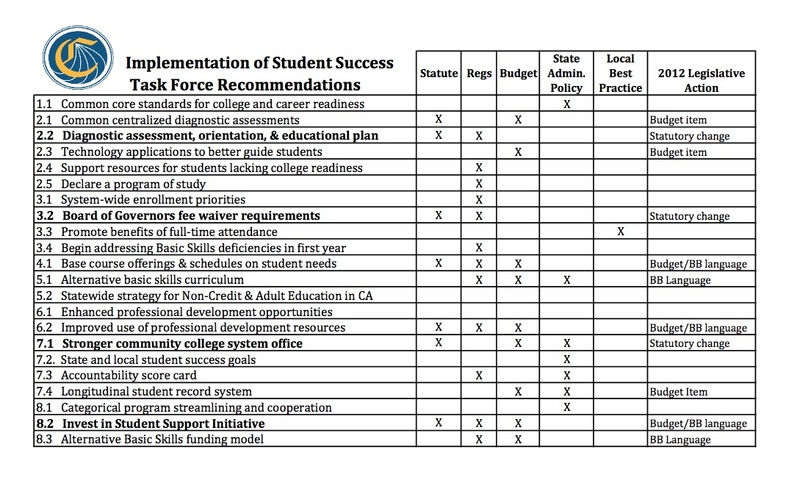 Likely state agency required to approve implementation of Student Success Task Force recommendations. (source: Board of Governors). Click to enlarge. Some are regulatory changes that can be accomplished by the Board of Governors; and those will probably start coming up for a vote at the next meeting in March. Others require statutory change and will have to go to the state legislature for action. Board members are expected to vote today on which state agencies need to approve each recommendation. Once they’re parsed out, there will be more opportunity for public comments and complaints. Looming over these proposals, however, is the state of community college funding in California. They have lost nearly a billion dollars in the past three fiscal years as a result of the state’s massive deficits. Even though community colleges essentially have open admissions, so many classes and course sections have been cut that about 130,000 students were turned away due to lack of space. That could jeopardize some of the recommendations, in particular the measures to hold orientation sessions for new students and require them to develop education plans. Providing that kind of individual support would require an increase in the number of counselors, who currently are assigned a minimum of 900 students each. Hiring enough to provide the guidance that students really need would cost about $300 million, according to a back-of-the-envelope estimate by Linda Michalowski, the Vice Chancellor of Student Services, an amount she says they’ll never get. In addition, task force members withdrew recommendations that would have cut the CalWorks program, which provides childcare, work study and job development for students who receive state assistance. However, when Gov. Brown released his 2012-13 budget proposal last week, he recommended a $1 billion cut to CalWORKS. The Board of Governors also eliminated a proposal to consolidate some categorical programs after getting an earful of complaints. Gov. Brown’s budget plan would reinstate it. There is at least one area where the Board of Governors is in agreement with Gov. Brown; unless his tax proposal is approved in November, preventing further cuts, getting through community college won’t be nearly as difficult as getting in.